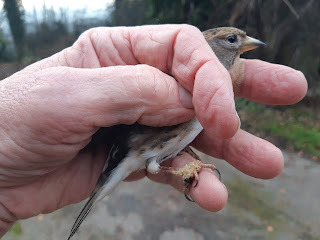 A few Bramblings in my Welshpool garden most days, but this is the first I've seen with presumed Papillomavirus, though it is common in the local Bullfinch population. It would be interesting to hear from Tony Cross or Paul Leafe in Radnor as to whether they are seeing it amongst their catches this winter. On my abortive hunt for Waxwings yesterday, a smart male Blackcap was in Buttington. Only had a couple of Brambling here both in nice condition. A few Siskin occasionally. Seen up to 100 Brambs so far and no sign of 'Fungusfoot".Our Bullies don't seem prone , but over the years it's been very common with the Chaffinches-since the Brambs hang about with their cousins it doesn't surprise if they get it too.